Delivery time just need about 3-5 days, shipping from US warehouse. Make your home look modern, clean & fresh looking like its been professionally interior designed. Each furniture piece has a high quality finish, solid, study design. Unique fashion design and high quality. A great chair for a study room or office. 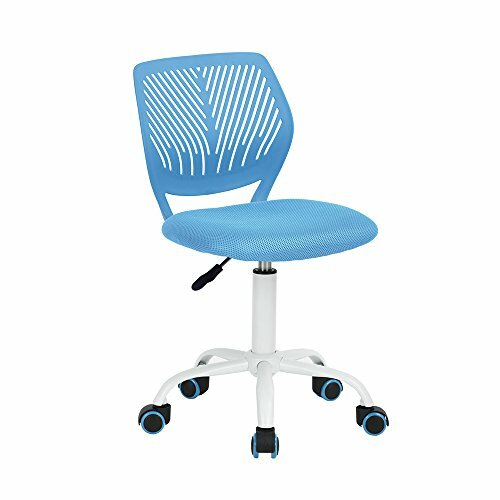 It is supplied with a comfortable plastic backrest, which was made to take care of your backbone and reduce a backache after long-lasting working hours. Another feature is the breathable seat that keeps your butts dry and cool even if the air conditioner is broken. Armless construction along with adjustable gas lifting and wheels on the legs provides lightweight and outstanding mobility so you can easily communicate with your colleagues or relatives while working. * Materials: polypropylene (PP) plastic structure, mesh fabric covering, metal base. * Size:40 x 38.5 x 75-87 cm, seat H 42.5-54.5 cm, base leg L 24 cm., more details please check the picture. If you have any questions about this product by Fanilife, contact us by completing and submitting the form below. If you are looking for a specif part number, please include it with your message.